(At left, chorizo filler meat.) If you go to any Basque event in the US, one thing you will always find is chorizo. In Boise, instead of hotdog vendors, they sell chorizo on the street corners. 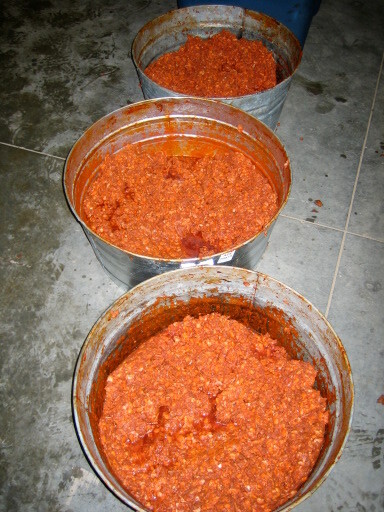 And there are a number of meat packers that mass produce Basque-style chorizo. But, in my opinion, nothing beats home-made. My dad has been making his own chorizo for maybe 20 years now. He never had time when I was a kid, but once I was off to college, he started making both chorizo and ham, in the jamon serrano style. Both are excellent and he and the guys he makes them with have gained a reputation. The annual chorizo-making effort has grown and is an event in and of itself. (The vets — Tony, Ramon and my dad Pedro — with the final product.) Even though I’ve had the luxury of feasting on dad’s chorizo and ham for a while now, I’ve never actually participated in helping make them. This year, during the Christmas holidays when we were visiting Idaho, I finally got a chance. A six-man crew, including my dad, Tony Larrocea, Ramon Ocamica (the veteran crew), Steve Zatica, Rick Uria, and Stan Zatica, met at Rick’s shop. A few days earlier, they had mixed together the meat. I unfortunately missed this all-important step, so I don’t have a good feel for what the “secret” recipe is. Suffice it to say that I did learn that they use the legs so as to ensure that there is enough meat in the filling. On the day I showed up, they had 5 buckets of filling ready for stuffing in the casings. And away we went. 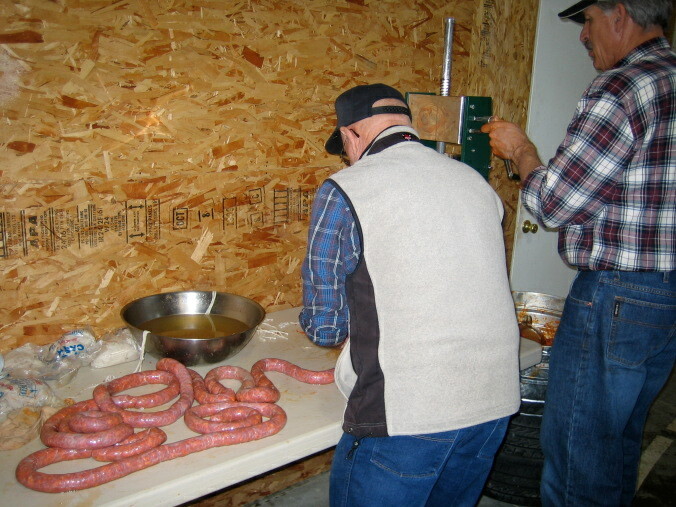 Tony and Stan, at left, manned the stuffer, filling the casings with the chorizo meat. 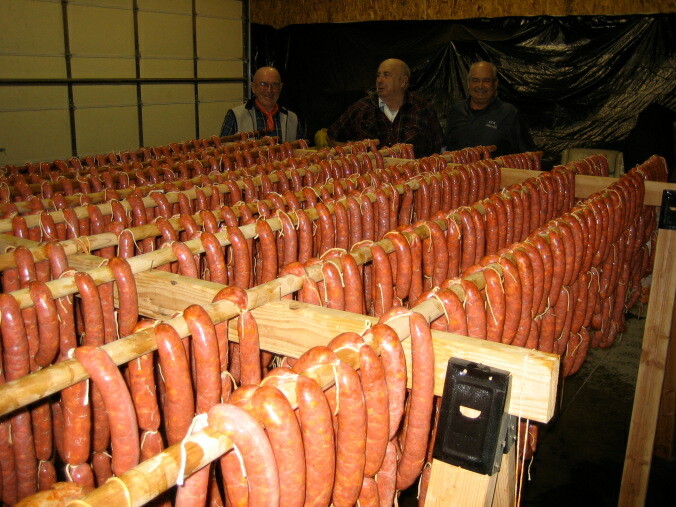 Rick, Ramon, and Steve tied the filled casing into sausage-length segments with string. I helped a bit with that and with poking the casings with a safety pin to release any trapped air. My dad, as his legs were bothering him, began preparing the feast we would enjoy afterwards. I don’t remember now how long we were there, but it was the better part of the afternoon into the evening. 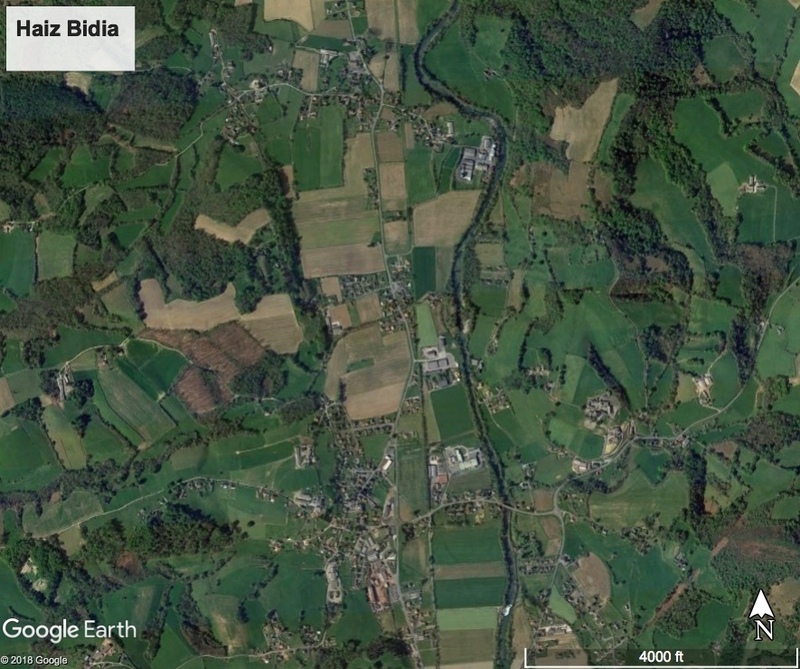 I’m guessing I was there for something like 5 hours (and I arrived a bit late too). I think, all told, they made 300 pounds of chorizo, about 60 pounds each (I think Tony donated his services for the evening). Once we were done, we had a feast fitting of the Basques, consisting of port ribs, solomo (pork loin prepared Basque style), home-made bread, courtesy of Teresa, Tony’s wife, and stew, all accompanied by good drink. We topped off the meal with several desserts, courtesy of Rick’s family. It was an excellent way to end the day and celebrate our efforts. (The full crew — Tony, Rick, Ramon, Pedro, and Steve, standing, and Stan, kneeling — at right.) Once the chorizos were finished, they let them sit in the shop, slightly heated (maybe 70 degrees, I think), for a few days to dry out. Again, I was lucky enough to still be in town to get to try a few, just a few days after they were made. And they were excellent! One of the best batches yet. Dad made sure to send me home with enough to tide me over until the next time I make it back to Homedale. The whole experience was great. While I’m a carnivore, and enjoy meat, I’m not a hunter, and have never really participated in any way in the production, if you will, of the food I eat. So, it was a good experience for me to get into the nitty-gritty, at least a little, and help make one of my favorite foods. They always say that one thing you should never observe is how sausage is made. And, while I missed the step that is most likely the origin of that saying, I definitely became even more appreciative of chorizo and what goes into making them. Eskerrik asko, jaunak! Thanks for letting me take part! I almost feel like I have eaten these myself. My Sister also makes her own sausage and she is your Parents neighbor I believe. I live in Oregon so I don’t get to eat them very often. Also I think my sister keeps them in a Gun Safe in the garage. I couldn’t begin to count the number of store bought chorrizo I have eaten in my life, and I have Loved every bite.But homemade is so much better. I think the pepper’s have a lot to do with the outcome of the stuffing. Those picture’s are torture for me to look at.The store’s around here don’t carry Basque chorrizo. Thank you for the pic’s and article. Very nice article. Would appreciate if you can publish the recipe. These pictures make me feel home sick! I can’t wait to go home and make some chorizo with my brother and sister. Thanks. We are making our second batch of chorizos March 5th. Here is the recipe everything is approximate.300lbs pork 70% meat 30% fat, paparika peppers no skin just meat of the pepper about 3 gal. of juice 6 lbs of blended garlic,and salt.Stir juice and garlic into course ground meat, let it sit for 3 days stirring daily by hand. We put our ribs in the meat and solomo. Put in casing,the color must be a nice red color.Pete,Ramon, and Tony are great to have with all their knowledge. 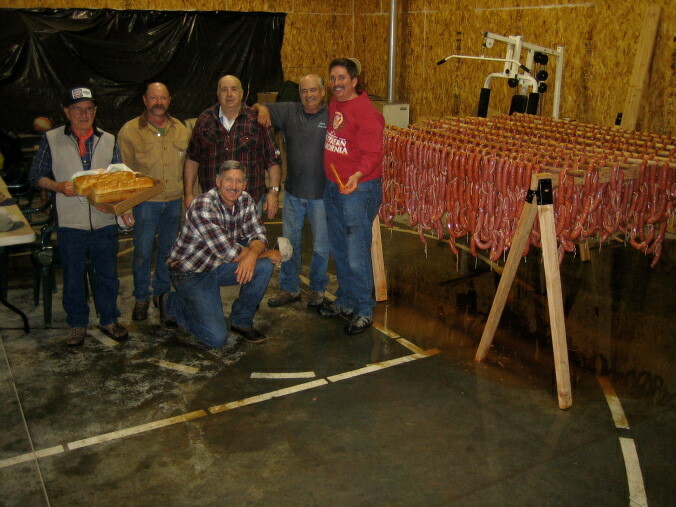 Here in Yuba City, California, we have been running an annual Basque Chorizo contest for the last 30 years. The event is always held in early February because that is when drying conditions are best. This year we had 25 entries. The entrants are usually a team of two or three people consisting of family or close friends. Many other people come for the event from miles around to eat, drink and converse with fellow Basques. In total there were about 200 people. Every one is asked to bring a dish to share because the event is also a potluck. Many of dishes are traditional Basque dishes such as lamb stew, tongue, mountain oysters and paella. This year we also had homemade sheepherders bread. And for desert there is always flan or Basque cake. As for the making of the chorizo itself I can offer the recipe my family has been using with some success in winning the contest. We start with around 30 lbs. of pork shoulder for which I am responsible to grind to the appropriate coarseness. This year I used a new hand grinder that came with a plate with the holes too small and so I went to a machine shop to have one especially made with large enough holes to get the proper coarseness. Sausage meat needs to be coarsely or the sausage meat is to mealy. The local butchers always ground our meat too fine so we have been grinding it ourselves ever since. Do not remove any fat or the chorizo will be too dry. Once all the meat is ground it is separated into 3 large bowls of 10 lbs. each. This is because my family is large enough that we can usually field 3 teams in the contest. I am the oldest of eight adult children some of whom have children old enough to compete themselves. My father also still participates even though it is my Irish mother who makes his chorizo. For the next step my mother and I work together to prepare the garlic and pepper. We use California Chili peppers which I guess are similar to paprika. It can be purchased at any grocery store and comes in small bags. The peppers are boiled in a pot on the stove to rehydrate them and soften them up. They are then run through a Kitchenaid appliance that separates the pulp from the skin. It’s the juicy red pulp that gives sausage the proper red color and adds a little to the flavor. Garlic by far is the primary flavorer. We use fresh cloves of garlic which are also run through the Kitchenaid to separate the pulp from the skin only this time we put the pulp into a small nylon stocking and then squeeze the juice from the pulp. The pulp is squeezed by using the hand squeezing and sliding it down in a gesture very reminiscent of milking a cow’s teat only instead a bucket the juice is squeezed into a small jar. Don’t panic that the juice turns green in short order as it is natural and doesn’t effect the flavor. Once these ingredients are prepared the team members meet at my mom’s to mix the spices with the meat. We all start with the same base recipe. For 10 lbs. of meat we mix in 4 to 5 Tbs. of garlic juice, 1/3 cup of California Chile pepper pulp, and 1/3 cap full of the following ground spices: black pepper, red pepper and white pepper. The recipe also calls for 2 1/2 Tbs. of salt though I only add 2 because more can be added later and it’s better to have too little to start which is easily corrected by adding a little more than to have too much to start which can only be corrected by grinding and adding more meat. Wine vinegar can be used for those who like a little more bite. That first day of mixing ends with everyone grabbing a little of their meat to make a patty and fry it up for tasting. Even though we all start with the same recipe no two taste exactly the same for unknown reasons. Everyone then critiques the other’s chorizo and offer suggestions. The bowl are then covered and refrigerated over night to give the spices time to work. The next day spices are added to correct any shortcomings. The meat is again covered and refrigerated. On the third day they are again tasted and any needed final spices are added. It is also the day the sausage press is pulled out and the meat is put in the casings. It requires at least two people to do. One turns the crank press while the other pulls the sausage as it tends to coil. The second person also has a pin present to poke any air pockets to let the air out. The sausages are hung in room slightly cooler than room temperature for three of four days to dry. The casings used by the way are pork casings for the proper size. Venison or sheep casings are to thin. As you can tell by the detail of this comment those of us who compete take the event very seriously and we put in a great deal of time and effort. Like any contest there is all kinds of trash talking such as accusing another contestant of trying to pass off store bought sausage or saying their chorizo appears more like bratwurst. The judges are the contestants themselves. This year as I said we had 25 entries. We start the contest by drawing numbers from a hat at random. Because we had five heats of five the numbers were 1-5. What ever number a team drew determined the heat they were in. Those who were in heat one were then sent off into a kitchen separate from hall so the judges couldn’t tell whose sausages were whose. Those who drew heat number five were seated at the judges table to await the sausages. When the sausages were done cooking the contestants were given one of five differently colored plates. Someone other than a contestant then carried the plates from kitchen to the hall and placed them on the judges table without saying whose sausages were whose. On the judges tables were bottles of wine and bread to cleanse their palate for better tasting. The judges then write which colored plate had the tastiest sausage. The ballots are handed to an emcee of sorts who calls out and tabulates each vote. In the event of a tie all other entries are removed except for the two tied and the judges taste and vote again. Heat two is judged by heat three and so forth with heat five being judged by heat one. Once all the heats are finished the winner of each heat goes back in the kitchen to cook a fresh batch. For the finals five elders who are not usually contestants are generally chosen to do the judging. After each heat and the finals are judged people swarm the tables to taste the chorizos for themselves offering their own critique. Thanks Stan and Beltran for sharing your recipes. I wish I was there to taste those chorizos as they were being brought from the kitchen. My mouth is still watering. My son Paul And I killed a pig yesterday.We will grind the meat today,and get started. I grow the red Txorre peppers and garlic.We will only use about 1/3 of the meat for chorizos. We use the same recipe my dad and I used.